Give isolation exercises the attention they deserve for a better pair of pecs. Long has the bench press been the king of upper body exercises, and believed to be the best way to increase size and thickness in your chest. However, big benching alone won’t produce the chiseled mass that most guys want. For maximum pec presence, you have to hit every muscle fiber at every angle. So by all means, keep benching, but don’t forget your flyes, crossovers and dips if you want to carve up that hard-earned chest mass. Since the pectoralis major’s muscle fibers run in many different directions and span across the freely moveable shoulder joint, they can perform many actions of the upper arm. So instead of focusing solely on pressing moves, it’s time to put your pecs to work in their main role: pulling your arms across your body. 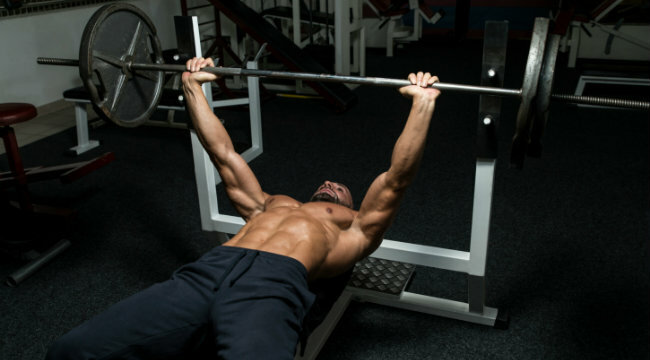 Most guys have the tendency on chest day to (1) always do bench press first in the workout, and (2) relegate flye and crossover moves to the end of the routine, almost as an afterthought. It’s time to rethink these habits. Training the pecs most effectively means emphasizing long range of motion, isolation movements on top of your bread-and-butter pressing exercises. Lighten the load if need be and take your muscles to failure. Train your pecs twice a week if they’re in need of some size, slow down your rep speed and make sure the pecs are doing the bulk of the work, as opposed to the delts and arms. To really nail your chest from all angles, we present the below two-pronged approach. On Day 1, you’ll use two isolation exercises (flyes and crossovers) as pre-exhaust moves for multijoint bench presses and dips. Later that week (Day 2), adding in some drop sets and changing the rep scheme will provide a pump that will take your pecs to the next level. Try these routines for at least four weeks for a noticeable improvement in the shape and aesthetics of your chest. And if you’re bench press one-rep max happens to drop off slightly, don’t worry. At least you’ll have chiseled pecs to show for it. *On your last two sets, perform eight reps to failure, then immediately drop the weight 20%-30% and do 6-8 more reps. Drop the weight once more and finish with 4-6 reps.